Early this morning I went with an acquaintance to meet with and speak to the Dushkinsky rebbe, Harav Yosef Tzvi Dushinsky shlit"a, of Israel. The rebbe, who is one of the leaders of the Eidah HaChareidis and the son and grandson of the previous two Gavads of Jerusalem, has been in New York for the wedding of one of his sister's children, and to visit with his chasidim and followers here in New York. Instead of appearing like many rebbes, with throngs of people waiting to do his every need and carrying a silver-tipped cane, the rebbe appeared very simply. When he entered the house, he came carrying the newspaper that had been left outside. Because the owners of the home where he was staying were not in New York, he said that he didn't want them to build up outside, making the walkway look cluttered and alerting would-be thieves that the homeowners are away. This may seem like something small and logical, but when someone speaks of or thinks of a rebbe, it conjures up images of being consumed by holiness and spirituality that places them elsewhere, on another plane of existence, not someone who pays attention to the minutia of small things that worry those of us engulfed by the physical world. 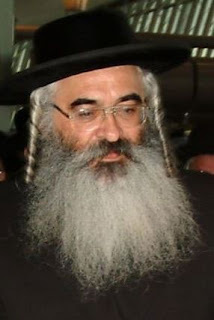 Dushinsky itself is rather new on the Chasidic landscape, having only been formed in the early 1930's after the current rebbe's grandfather moved to Israel and accepted the mantel of leadership of the Eidah HaChareidis upon the death of Harav Yosef Chaim Zonnenfeld zt"l. The first Dushinsky rebbe was one of the most outspoken opponents of the formation of the Zionist State of Israel, delivering a famous speech to the United Nations explaining the Jewish case against establishing the country. After his death in 1948, his son (the current rebbe's father) Harav Yisroel Moshe Dushinsky zt"l became the rebbe and leader of the Eidah until his passing 2003, when the current rebbe accepted the mantel of leadership of the chasidus, with Harav Yitzchok Tuvia Weiss shlit"a becoming the head rabbi of the Eidah HaChareidis. When I sat and spoke with him, he was very interested to hear what was going on in my life, and showed himself to be very simple and humble. After learning of where I daven (pray) here in Boro Park, he commented that he knew the rav of the shul, and he also happens to be a close cousin of my rosh yeshiva from Israel. The rebbe's wife, in a somewhat unexpected way, also sat at the table with us and spoke. She was very animated and open, and when she spoke to be she looked at me directly in the eyes, which is not something that religious women of her caliber would normally do. The rebbetzin (rebbe's wife) spoke to me at length about shidduchim (the matchmaking process), and proved to be a very clever woman. When it came time for me to go, she told me that she and her husband would very much like to hear from me when they return to Israel, and that they would like to have me in their home on any trip that I make to Israel. As I left, another man entered to meet with the rebbe, and the rebbe walked to him, introduced himself to him, and began to take interest in hearing his many requests from the rebbe, something that would usually be more formal with other rebbes, who have assistants and secretaries to listen to and organize visitors. At the end of the visit, I came away with a very positive and comforting view of the rebbe, who, along with his wife, seemed very down-to-earth and genuinely kind, a mensch-par-excellence. misunderstood, so take care and use it wisely.